With the exception of Thanksgiving Day, no one really cares about Thursday night football games. In general, they’re fairly awful to watch. The players are still hurt from their previous games, there’s not enough time for the coaches to game plan, and, honestly, on Thursday nights there’s plenty of other stuff on worth watching. Covert Affairs, White Collar, Elementary, The Big Bang Theory, X Factor… you get it. Mondays, though, are a different story. 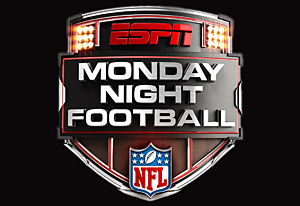 Monday Night Football, despite the numerous attempts to weaken the brand (the addition of Thursday Night Football and NBC’S Sunday Night Football are obvious culprits), still has a lot of cache. After all, ESPN paid $15 billion (with a B) for the right to broadcast it through 2021, so it’s not going away any time soon. Plus, you get to listen to Jon Gruden say some generally hilarious things. And, for my (short) money, it’s great to have a Monday night game as a special gift after a case of the Mondays at work. And wouldn’t you know it, today is one of those magic Mondays… the Patriots are playing. The entire day is now re-framed with the proverbial light at the end of the Monday tunnel being the game at 8:20. At breakfast, my oldest son and I strategize on how to get Mom to let him stay up a little later than usual to watch at least the entire first quarter. The younger brother catches wind of the plot and won’t be denied an attempt to finagle the same deal. The two girls don’t really get it, and since they’ll be in bed anyway, it doesn’t matter. I check the refrigerator for cranberries to allow for the usual MNF tradition of cranberry bread making. I need a few players to come up big in fantasy football, so I’ve got a more-urgent-than-usual rooting interest in tonight’s game. After all, I’m somehow 5-5 in all three of my leagues, so I’m looking to build some momentum. I will certainly be up watching the postgame show until, oh, 12:30, if the Patriots win. This is ordinarily fine, however I have an 8:15 meeting tomorrow morning, so today it’s a little less OK. But as it says in Pirke Avot, the reward is proportionate to the suffering. Regarding the game, the 7-2 Patriots are visiting the 6-3 Bank of America Carolina Panthers, and the media sharks are predictably circling. Stop me when you’ve heard this before: Brady’s getting old, Gronk isn’t healed (and he’s a racist! ), the defense is too banged-up, Amendola’s too breakable, the Panthers defense is too fast… so the Pats are going to lose. Well, call me a homer, but I’m not buying. In the Brady era, these are the games the Patriots always win. They love being disrespected, underappreciated, and castigated by the national media. For reasons that far exceed Spygate, everyone hates the Patriots, Belichick, and our nice little decade of dominance. So, bring it on, world. I look forward to eating my cranberry bread, wearing comfy pajamas, and watching the Patriots frustrate the nay-sayers yet again.